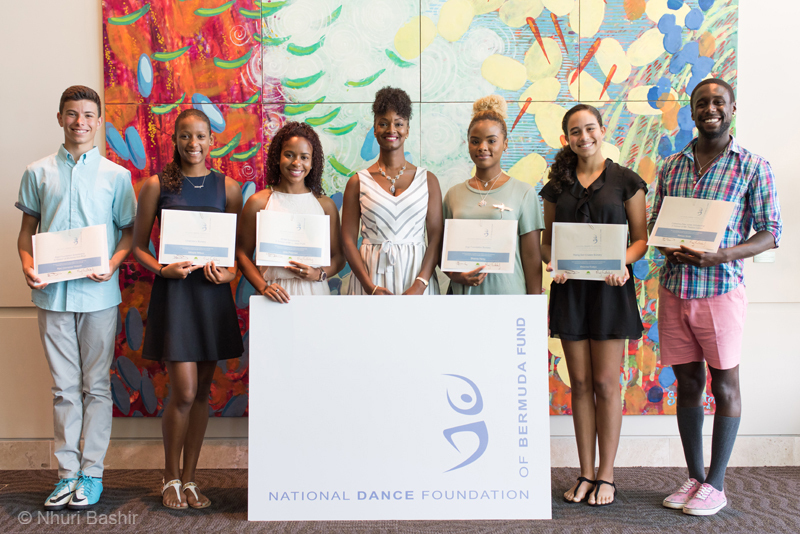 The National Dance Foundation of Bermuda announced that eight of Bermuda’s most talented young dancers — Ravi Cannonier-Watson, Mikayla Wilson, Jada Pearman, Shanna Henry, Rihanna Evelyn, Marcus Smith, Taylor Railton and Alexis Smith — have all received scholarships. “It is these scholarships that will enable and support these gifted young Bermudians in their pursuit of professional training at prestigious dance schools, colleges and universities overseas, and it is these awards that will help launch a professional career on the international stage and an eventual return to the Island to teach the next generation of Bermudian dance students,” a spokesperson said. “This dance scholarship legacy was established by the Bermuda Ballet Association in 1962 then in 2005 the National Dance Foundation assumed the responsibility for continuing these awards. “Over $1 million has been given thanks to the charitable generosity of individual and corporate donors in the community. As a result there are now an unprecedented number of Bermudians dancing on professional stages in London, Europe, the United States and Canada. Senator Crystal Caesar of the Dance Foundation Scholarship Committee, said, “The most prestigious Catherine Zeta Jones Award in memory of Patricia Calnan valued at $15,000 has been awarded to 21 year old Marcus Smith. Marcus is an exceptionally talented young man and has been given this award for three years. He has achieved an exemplary reputation at New York’s Tisch School of the Arts where teachers say he is one of their finest students in recent years.”  Patricia Calnan’s son, Acting Superintendent Nicholas Pedro, presented this award. “The National Dance Foundation is deeply grateful to the Argo Foundation and the Argo Group of International Holdings CEO, Mr. Mark Watson, for contributing $15,000 for funding for Bermuda’s dancers. “The Argo Foundation Scholarship in honour of Madame Ana Roje, is awarded to Ravi Cannonier, who is in his second year at the Royal Ballet School in London. Argo bursaries have been awarded to Taylor Railton for her BA study in Dance Performance at the State University of new York [SUNY] and to Shanna Henry who is studying dance at Monclair University and is active in Bermuda’s dance community in the summers helping young dancers. The awards were presented by President of the Argo Foundation, Elspeth Gray. “The BF&M Scholarship of $7,500 in honour of L.John Profit has been awarded for the third year to 20-year-old Jada Pearman, a top academic student studying for a BFA at the University of Arizona and well on her way to a professional career. BF&M and CEO Mr. John Wight have generously supported this scholarship since 2005. We do appreciate that Mrs. Gina Bradshaw, Vice President of Client Services at BF&M who was a personal friend of the late John Profit presented this award. “The Arch Scholarship of $7,500 in memory of Georgine Mary Russell Hill, former member of the National Dance Foundation’s board and a distinguished community humanitarian is awarded to Alexis Smith. Alexis is a gifted dancer studying at the University of Arts in Philadelphia. Arch’s Head of Worldwide Treaty Property, Matt Dragonetti, together with Dr. June Hill, daughter of Mrs. Georgine Hall, presented this award. “The recently established Chairmen’s Scholarship of $5,000 is awarded to up and coming Bermudian, Mikayla Wilson. Mikayla is an exciting young talent who will be starting her first year at Point Park University. This award sponsored by Chairman Don Kramer and Deputy Chairman Brian O’Hara , was presented by Brian O’Hara. “The final award, the Rising Son Cruises Award, of $1,000 is given to Rihanna Evelyn to encourage her as she starts her study in Performing Arts at the well recognized, Grier School. This award was presented Rising Son Cruises representatives. “Our sincere thanks to the Bermuda Community Foundation for their advice and help, to XL Catlin for lending us this wonderful venue, and also for the most generous support from wonderful donors and individual members of the community who have allowed these young Bermudians to raise the bar of dance excellence.